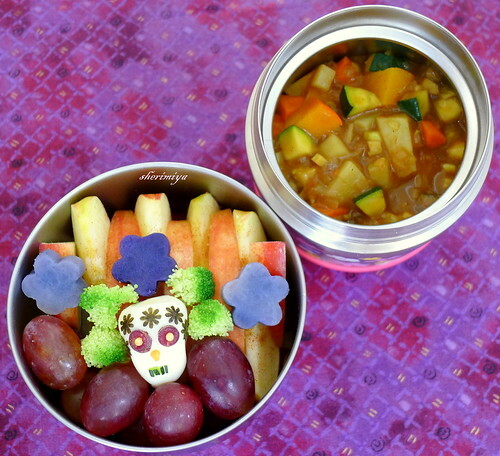 Curry Dia De Los Muertos Bento, a photo by sherimiya ♥ on Flickr. Today I decided to make vegetable curry, but wanted to try a new recipe. I used Nami's Keema Curry recipe at her popular blog Just One Cookbook. If you haven't checked it out, you really should! 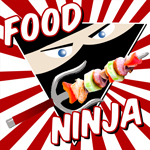 She has a lot of great recipes here, and always includes photos and step-by-step instructions. I chose this one because it looked delicious, and it seemed quick and easy (my forte!). I was right on all counts. I omitted the ground pork and added a lot of veggies I happened to have on hand: kabocha, zucchini, potatoes, carrots and onions. I made extra for bento, and it was a good thing I did because the kids inhaled it. I made it mild and added some applesauce too, and they loved it. I packed it into a thermal bento, along with a side container of cinnamon-sprinkled apples, grapes, broccoli, Okinawan sweet potato, and a colorful quail egg Dia de los Muertos skull. Happy Wednesday friends! Shared at Allergy Friendly Lunchbox and What's For Lunch. Mmm, I can almost smell the curry! The colours are so gorgeous! And that tiny dia de los muertos skull is seriously amazing. Too pretty to eat yet probably too irresistible not to! That skull is perfect for Dia de los Muertos! So cool! I'm going to have to check out that curry recipe, it looks delicious! I wonder what could I replace eggs with, my bf doesn't like eggs at all and it seems a bit fatty to use mozzarella balls. But the white round shape is so inviting to make faces and such! I've made a couple of bentos now, they weren't that pretty but he got few "ooh"s and "aah"s at the office :D The pics won't come out nice, since it's really dark in here when I assemble the box (late night or early morning). Love your colourful skeleton. I'd never heard of Dia de los Muertos skull, but it's certainly cute :)! Thanks Chantale, Heather, Elina, Cooking Gallery and melonpan! I love this! You are so clever and creative! The thermal bento is so cute. I need to look for something like that for our winter bentos. Love the way you presented everything. Thanks very much Audrey's mom. I really highly recommend a thermal bento for winter. Really very practical, especially for kids that prefer hot meals. For a bigger appetite I recommend the Stanley stainless steel thermal jar. It keeps food piping hot for at least 5 hours. Love it!